Figure 1. States with at least one fish consumption advisory for mercury. Source: USEPA Fish Consumption Data Base. By Krabbenhoft, David P.; Rickert, David A.
Mercury has been well known as an environmental pollutant for several decades. As early as the 1950's it was established that emissions of mercury to the environment could have serious effects on human health. These early studies demonstrated that fish and other wildlife from various ecosystems commonly attain mercury levels of toxicological concern when directly affected by mercury-containing emissions from human-related activities. Human health concerns arise when fish and wildlife from these ecosystems are consumed by humans. During the past decade, a new trend has emerged with regard to mercury pollution. Investigations initiated in the late 1980's in the northern-tier states of the U.S., Canada, and Nordic countries found that fish, mainly from nutrient-poor lakes and often in very remote areas, commonly have high levels of mercury. More recent fish sampling surveys in other regions of the U.S. have shown widespread mercury contamination in streams, wet-lands, reservoirs, and lakes. To date, 33 states have issued fish consumption advisories because of mercury contamination. These continental to global scale occurrences of mercury contamination cannot be linked to individual emissions of mercury, but instead are due to widespread air pollution. When scientists measure mercury levels in air and surface water, however, the observed levels are extraordinarily low. Figure 2. The droplet of mercury shown in this slide is about 1 gram; the same amount that is in a standard mercury thermometer and the total amount that is deposited annually on a lake in northern Wisconsin with a surface area of 27 acres. In fact, scientists have to take extreme precautions to avoid direct contact with water samples or sample containers, to avert sample contamination (Fig 3). Herein lies an apparent discrepancy: Why do fish from some remote areas have elevated mercury concentrations, when contamination levels in the environment are so low? How does mercury become a toxicological problem? an organism lives, so that larger predatory game fish will likely have the highest mercury levels. Adding to this problem is the fact that mercury concentrates in the muscle tissue of fish. So, unlike organic contaminants (for example PCBs and dioxins) which concentrate in the skin and fat, mercury cannot be filleted or cooked out of consumable game fish. Figure 3. Because there is actually very little mercury in most natural waters, scientists have to use extreme measures when sampling for mercury to avoid sample contamination from their hands and clothing. This entails the use of lint-free suits, plastic gloves, hoods, and stringently cleaned sampling equipment. 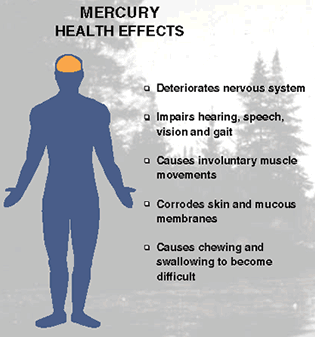 What are the human health effects of mercury toxicity? The most well documented cases of severe methylmercury poisoning are from Minamata Bay, Japan in 1956 (industrial release of methyl-mercury) and in Iraq in 1971 (wheat treated with a methylmercury fungicide). In each case, hundreds of people died, and thousands were affected, many with permanent damage. In milder cases of mercury poisoning, adults complain of reductions in motor skills and dulled senses of touch, taste, and sight. These milder effects are generally reversible if exposure to mercury is halted. Unborn children are at greatest risk from low-level exposure to methylmercury. Recent research suggests that prenatal effects occur at intake levels 5-10 times lower than that of adults. If these results are confirmed, a substantial fraction of unborn children would be at risk. Mercury can take a myriad of pathways through the environment. Figure 4. Mercury (Hg) biomagnifies from the bottom to the top of the food chain. Even at very low input rates to aquatic ecosystems that are remote from point sources, biomagnification effects can result in mercury levels of toxicological concern. another. It can be brought to the sediments by particle settling and then later released by diffusion or resuspension. It can enter the food chain, r it can be released back to the atmosphere by volatilization. The concentration of dissolved organic carbon (DOC) and pH have a strong effect on the ultimate fate of mercury in an ecosystem. Studies have shown that for the same species of fish taken from the same region, increasing the acidity of the water (decreasing pH) and/or the DOC content generally results in higher body burdens in fish. Many scientists currently think that higher acidity and DOC levels enhance the mobility of mercury in the environment, thus making it more likely to enter the food chain. Many of the details of the aquatic mercury cycle are still unknown, however, and remain areas of active research. How does mercury enter the food chain? The exact mechanism(s) by which mercury enters the food chain remain largely unknown, and probably vary among ecosystems. We do know, however, that certain bacteria play an important early role. Studies have shown that bacteria that process sulfate (SO4=) in the environment take up mercury in its inorganic form, and through metabolic processes convert it to methylmercury. The conversion of inorganic mercury to methylmercury is important for two reasons: (1) methylmercury is much more toxic than inorganic mercury, and (2) organisms require considerably longer to eliminate methylmercury. At this point, the methylmercury-containing bacteria may be consumed by the next higher level in the food chain, or the bacteria may release the methylmercury to the water where it can quickly adsorb to plankton, which are also consumed by the next level in the food chain. Where does atmospheric mercury come from? There are many sources of mercury to the environment, both natural and man related. Natural sources include volcanoes, natural mercury deposits, and volatilization from the ocean. The primary human-related sources include: coal combustion, chlorine alkali processing, waste incineration, and metal processing. Best estimates to date suggest that human activities have about doubled or tripled the amount of mercury in the atmosphere, and the atmospheric burden is increasing by about 1.5 percent per year. Has there always been mercury contamination, or is this a recent problem? plankton or bacteria. These microorganisms are consumed by organisms higher in the food chain, or after dying, settle to the bottom of the lake and are incorporated into bottom sediments. Studies of sediment cores show that younger sediments deposited since industrialization have mercury concentrations that are about 3-5 times that of historical sediments. Thus, the fact that these sediments are primarily composed of dead microorganisms that were once the bottom of the food chain would suggest that modern levels of mercury in the food chain are elevated over preindustrial times. If human-related emissions could be eliminated or reduced, how long would it take for ecosystems to recover? The only way to attempt to answer this question is to incorporate all the best information currently available on how mercury behaves in the environment into a computer model. Such a model was constructed as part of the research effort on northern Wisconsin lakes. Modeled scenarios predict that if emissions could be reduced by 5 percent, it would take 8 years before any change in fish concentrations would be observed, and the decrease would be small. Figure 5. All forms of mercury are toxic to humans, but methylmercury is especially of concern because our bodies have a less well developed defense mechanism against this toxin. Effects on the nervous system are the most prevalent in humans. conduct state-of-the-art contamination studies. Thus, the USGS is well situated to advance the understanding of mercury cycling in aquatic ecosystems and to assist resource management agencies in developing strategies for reducing the effects of mercury contamination. Mercury as a Global Pollutant (D.B. Porcella, J.W. Huckabee, and B. Wheatley, editors), Water, Air and Soil Pollution, 80 (1-4), 1995. Photo 1. The U.S. Geological Survey has participated in mercury cycling studies in Northern Wisconsin lakes. Photo 2. Currently, the U.S. Geological Survey is conducting mercury cycling studies in the Florida Everglades. Photo 3. Clean sampling techniques can be adapted for use in almost any environment, including wetlands, lakes, and streams. Photo 4. Currently, the U.S. Geological Survey is conducting mercury cycling studies in the Florida Everglades. Figure 6. Mercury cycling pathways in aquatic environments are very complex. The various forms of mercury can be converted from one to the next; most important is the conversion to methylmercury (CH3Hg+), the most toxic form. Ultimately, mercury ends up in the sediments, fish and wildlife, or evades back to the atmosphere by volatilization. Reprinted with permission from Mercury Pollution: Integration and Synthesis. Copyright Lewis Publishers, an imprint of CRC Press. Document Accessibility: Adobe Systems Incorporated has information about PDFs and the visually impaired. This information provides tools to help make PDF files accessible. These tools convert Adobe PDF documents into HTML or ASCII text, which then can be read by a number of common screen-reading programs that synthesize text as audible speech. In addition, an accessible version of Adobe Reader for Windows (English only), which contains support for screen readers, is available. These tools and the accessible reader may be obtained free from Adobe at Adobe Access. Send questions or comments about this report to the author, David Krabbenhoft, (608) 821-3843. For more information, visit the Wisconsin Water Science Center.